What a beautiful Art Deco influenced cabinet design and to top it off, it's a Stewart Warner. You just don't seem many of these around. Cabinet designed by Mastercraft, and it's lovely with the curvy speaker grille cut-outs and walnut insert. This Deco cabinet has been refinished using the finest toning and finishing lacquers, producing a lovely finish. 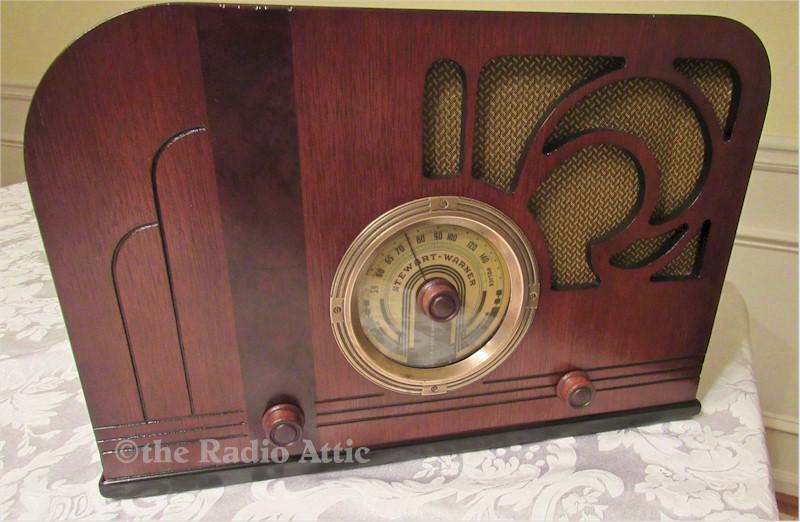 The electronics have been completely restored (no shortcut repairs and it is internally fused for your safety), and it plays very nicely on the AM Broadcast band. These seem to be a bit hard to come by and sure would make a nice addition to your collection. 15"W 10"H x 8"D.